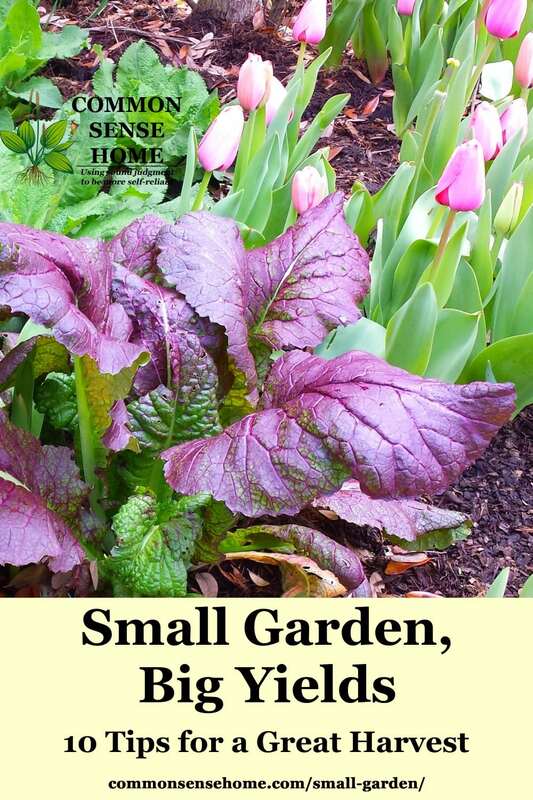 Here are ten garden ideas for small spaces to help you grow more food in a smaller footprint. Have you ever heard the saying “Grow food not grass?” It’s a good motto to adopt. Grass depletes lawns of their nutrients, requires a lot of water to maintain, and serves very little purpose other than being eye candy, not to mention the constant mowing. You can take a 10'x10′ patch of grass and turn it into a beautiful edible garden, which can feed your family and be aesthetically pleasing. Look at your yard and see what is in your landscape that doesn’t serve a greater purpose. Can you replace that juniper bush with a blueberry bush? What about the ornamental grass with lemon grass, kale, or other edible greens? Do you have a small tree that you can replace with a dwarf fruiting tree? Once you start to look at your landscape as a means to serve you nutritionally instead of aesthetically, you open up a whole new world of gardening opportunities. See “Edible Landscaping with a Permaculture Twist” for more information on edible landscaping. Planting to invite pollinators on purpose is something we often overlook. If you are planting a small food garden on a patio, balcony, or are creating a garden for the first time in your yard, it is crucial to create a habitat that invites pollinators. Mix flowers in with your vegetables or herbs to attract pollinators and add a pop of color. Never underestimate the value of pollinators; they are one of the key elements to your gardens success. See “Vegetable Companion Planting in the Garden” for more companion plant ideas to attract pollinators, and “Top 10 Edible Flowers” for flowers that both you and the bees can enjoy. If you have a flat landscape, you can create more soil surface to grow a garden by adding soil elevation. (See Hugelkultur below.) Think three dimensional gardening, instead of two dimensional. You can grow more on a mound than you can on flat land, so build a mound or elevated spiral to create more planting surface to increase your small garden yield. 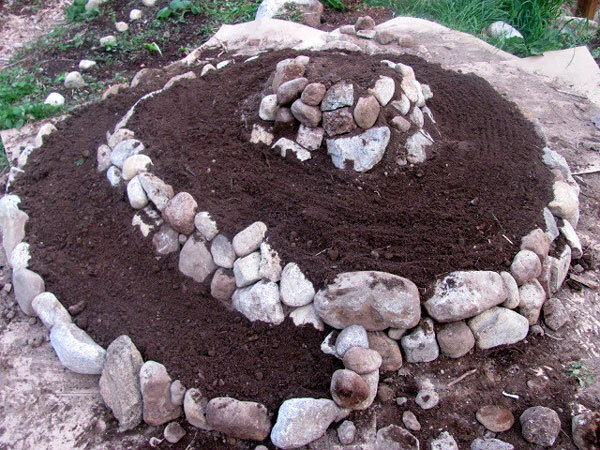 Mounds and spirals also create great focal points in a small garden landscape. For example, say you have a 5 sqft area of flat growing space; you can only plant a garden that is 5 sqft. But if you add a 2 ft mound in the middle of that 5 sqft and taper it down, now you’ve created almost double the square footage of gardening space on that same piece of land. Hugelkultur (HOO-gul-culture) meaning hill culture or hill mound: Instead of putting those branches, leaves and grass clippings in bags by the curbside…build a hugel bed. Simply mound logs, branches, leaves, grass clippings, straw, cardboard, petroleum-free newspaper, manure, compost or whatever other biomass you have available, top with soil and plant your veggies. If you are gardening in small spaces like container gardening, garden boxes and raised beds, you have pay extra attention to your soil's nutritional needs. Plants deplete the nutrients at a quicker rate with small gardening than large-scale gardening. Add organic compost, top-dress soil and spray with compost tea regularly. Rotate crops by not planting the same type of plant in the same spots each year. Healthy soil promotes healthy plants, and healthy plants provide better nutrition and can resist pest and disease. Pick plant varieties that maximize your available space. For example if you only have 1sq ft of gardening space available, don’t plant cabbage, broccoli, cauliflower, etc. in that space. 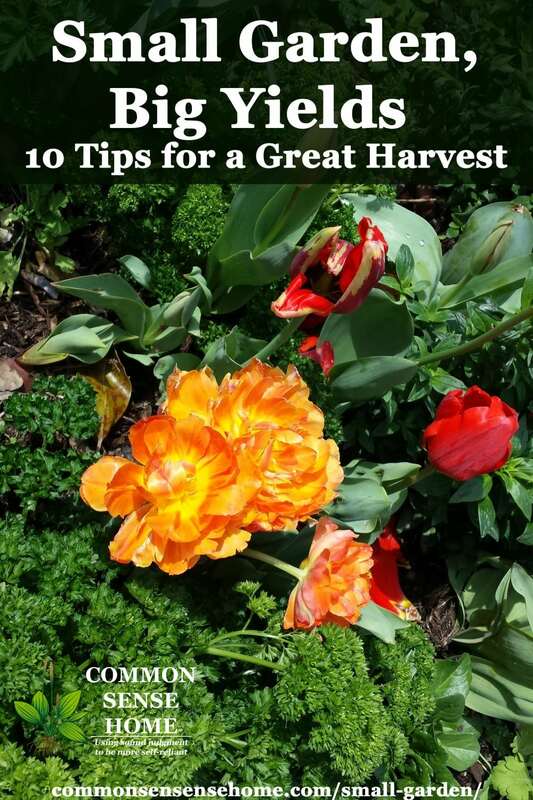 You will only receive one harvest from these plants, and they take 1sq ft space per plant. 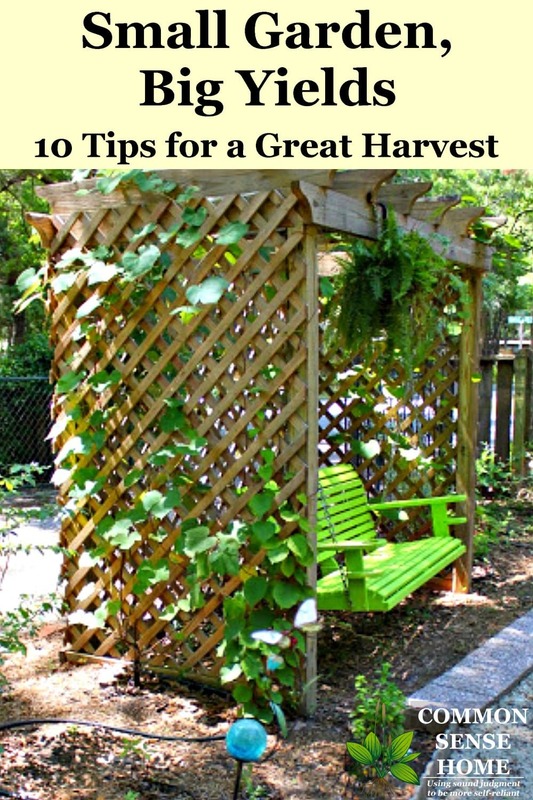 Grow anything that vines (tomatoes, cucumbers, squash, pole beans, grapes, and other vine fruits) on a trellis. (See #7 below.) Try potato towers for an easy harvest in a small garden footprint. Look at every small space with some sun as an opportunity to grow food: porch, balcony, roof, landscape, windowsill, fence, mailbox, driveway, walkway, decks, or by swings. Explore the opportunities right outside your door. 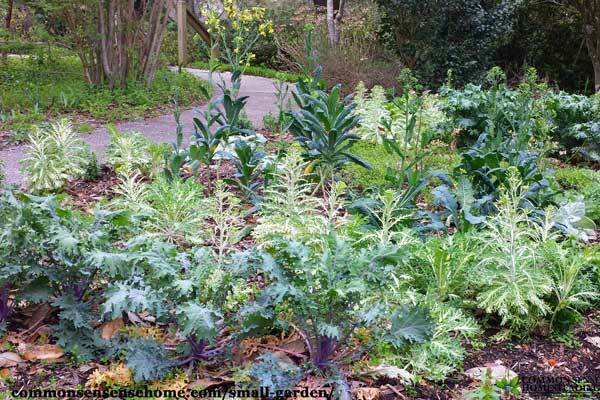 Walkway – Line your walkway with cabbage, kale, mustards or other eye pleasing edibles. Fence – Hang garden boxes from your fence or plant vining produce. By growing plants vertically you help reduce gardening problems like leaf fungus and fruit rot because air is circulating through the plant reducing moisture buildup and the fruit is off the ground. There are many different trellis mediums you can use to garden vertically. Pretty much anything the plant tendrils can latch onto, the plant can grow up; lattice, wire, bamboo, pallet, netting, rope, I’ve even seen the springs from a baby crib. The possibilities are only limited by your imagination. To learn more about vertical gardening read, “Transform Your Landscape with Vertical Gardening: 10 Reasons to Grow Up Instead of Out“. Almost any fruit tree you can imagine is now available in a dwarf variety, allowing you to grow fresh fruit in a small yard. On our small little slice of heaven (1/4 acre) we have; 2 lemon trees, 2 lime trees, 1 keylime tree, 2 tangerine trees, 3 fig trees, multiple plum trees (one planted and several volunteers), 1 blood orange tree, 1 grapefruit tree, 2 pear trees, and a fruit cocktail tree that produces; plums, peaches, apricots, and nectarines. When growing fruit trees, keep in mind that many varieties need to cross pollinate, so you may have to buy two. Even if a fruit tree is advertised as ‘self-pollinating’, they will produce better if they have another tree to cross pollinate with. Use companion planting to grow plants under other plants or trees to grow additional crops and increasing your yield. Plant carrots under tomatoes, radishes or beets under cucumbers, pole beans with potatoes or radishes, grow garlic, onions, and herbs under trees to maximize your harvest and space. A perfect example of this gardening style is known as the Three Sisters. The three sisters is a Native American method of gardening and consist of planting corn, squash, and beans together. The three crops benefit from each other, the corn provides a trellis for the beans to climb, the beans provide nitrogen for the corn and squash, and the squash helps prevent weeds from growing by blocking sunlight to the soil and creates a microclimate which aids at retaining water. 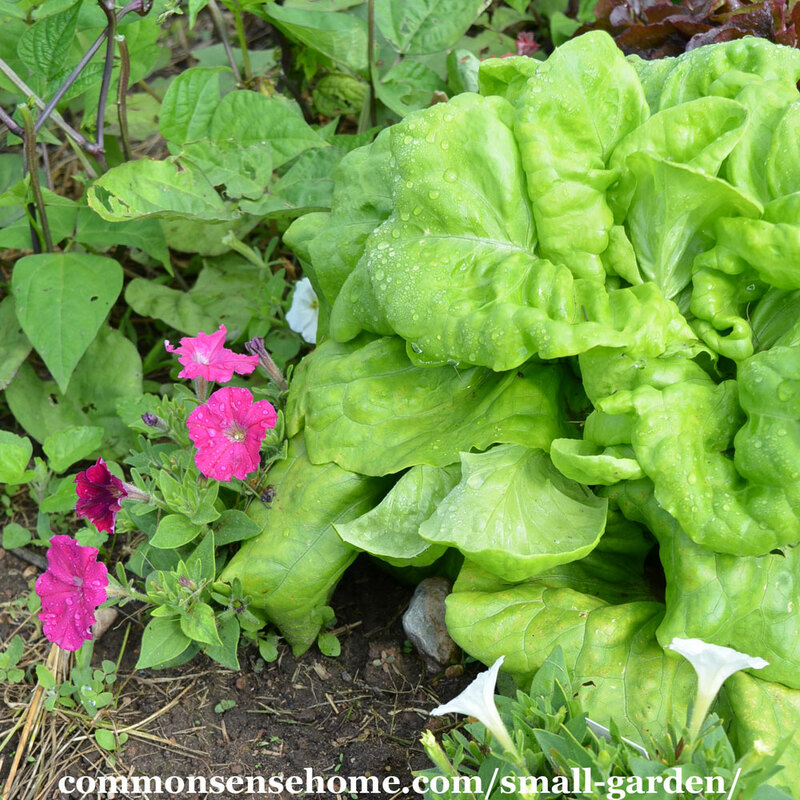 See Vegetable Companion Planting in the Garden for more detailed companion planting ideas. Do you have a sunny window? Turn it into a mini garden. You can grow many herbs indoors successfully like basil, chives, parsley, cilantro, thyme, and ginger. Try your hand at micro greens or sprouts – both have a high nutritional content. Micro Gardening: “Micro-gardening” is the intensive cultivation of a wide range of vegetables, roots and tubers, and herbs in small spaces, such as balconies, patios and rooftops. While urban residents have long grown vegetables in backyard plots, modern micro-gardening makes use of containers such as plastic-lined wooden crates, custom-built tables and even old car tires. It integrates horticulture production techniques with environmentally friendly technologies suited to cities, such as rainwater harvesting and household waste management. Mushrooms (a tasty source for vitamin D) grow great indoors and many grocery stores sell starter kits. Grow a dwarf lemon or mandarin orange tree indoors to add beauty, color and fruit. Lettuce pots grow well indoors providing you with fresh salad ingredients all year. See “Fresh Food from Small Spaces – Grow Fresh Food in the City or Suburbs” for more micro-gardening ideas. Never let a lack of space prevent you from growing your own food. You will be amazed with what you can do with a little growing space. We'd love to read your comments about how you make the most out of your small gardening space! 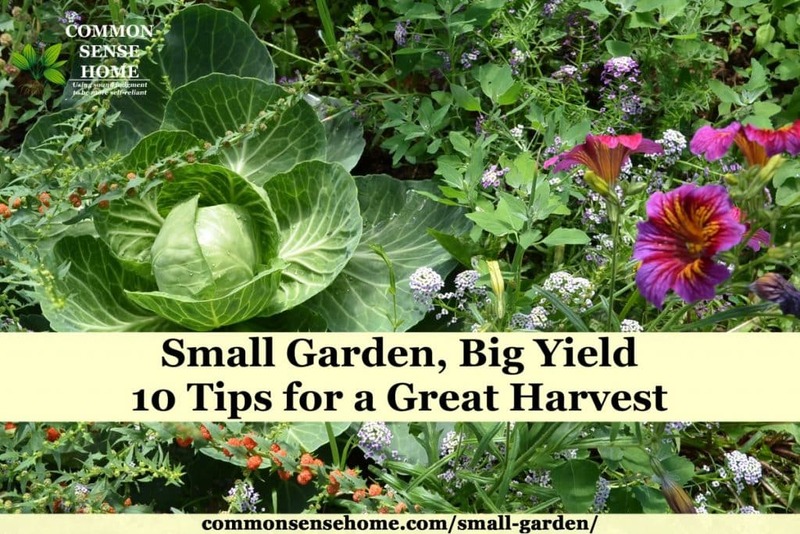 Don't forget to check out “Common Sense Gardening – Home Garden Ideas from Planting to Harvest” for a full listing of all the gardening posts on the site. You can also get free garden planning templates here. Originally published in 2015, last updated in 2018. There are so many great ideas in here – thank you! I’m also going to try straw bale gardening this year, which you can pretty much do anywhere, and can customize the number of bales for whatever space you have. 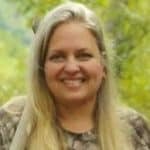 I’ve seen some amazing things done with straw bale gardening, and there’s a presentation on it that will be featured during the Home Grown Food Summit. She did a great job and I’m so happy to have her writing for the site. This is such a great article. I have a small garden space and this relate so much. Great ways to make landscaping life easier. Thanks for all the great tips and advice! I totally agree about the opportunity to get massive yields from a small garden. I’ve had biggish plots (4.5 acres) and smaller ones (1/10 acre) and to be honest, I prefer the small ones! When I was living in Australia I had a ton of space, but overwhelm was never far away. I ended up with a small vegetable garden over there and used the biointensive method to prepare and plant my beds. These were the healthiest and most productive beds I have ever had. Absolutely brimming with food. I’ve continued this style of gardening since moving back to England and I could not be happier. Loads of food, a lot less overwhelm and it just works for me. wow, Amazing work Amber! This is such a great article. I have a small garden space and this relates so much. Great ways to make landscaping life easier. I’m surely going to implement these tips. What are the best seeds to sow for summer season in small area? I love color and durability. I don’t have space as I live in a condo? Thank you. Are you talking about growing inside or growing outside, and growing vegetables, herbs or flowers? If you need to grow inside, check out this post on indoor gardening for examples of what one reader is growing in her condo. What climate are you in? Amber lived in South Carolina when she wrote this. The plants listed in #5 are some of the best for yields in very small areas. You could add flowers or herbs for color.